From watching makeup tutorials on YouTube, to the incredible excitement we all get when we buy new items from our favorite makeup company, it’s safe to say that makeup makes the world go ’round! For all of us makeup lovers, we have been following the NYX FACE Awards competition, and as we get from 30 finalists, to 20 finalists, now 12 finalists and soon 6 finalists, we are introduced to even more fabulous talent in the makeup industry. NYX Cosmetics is having their 5th Annual NYX Fine Artistry of Cosmetic Elites (FACE) Awards taking place on August 20, 2016 in Los Angeles, California to name the “Beauty Vlogger of the Year;” and none other than the beauty guru and makeup genius herself, Kandee Johnson will be hosting the event. Each of the contestants had to create makeup tutorial videos that showed them completing the themed NYX challenges including Anime and fairy tale. The event will have a group of phenomenal judges that are beauty industry insiders and leading makeup artists. The judges for this year’s event will be Ve Neill, Academy-Award winning makeup artist; Melissa Giannini, Editor-in-chief of NYLON; and Megan McIntyre, Beauty Director at Refinery29 and more. In addition, makeup artist and YouTube guru, Charismastar will Emcee the event. It was just announced today that the following outstanding individuals are the top 12 finalists in the competition. The winner of the NYX FACE Awards will receive a prize of $50,000, consultations with pro makeup artists and a year’s supply of NYX Cosmetics. The five runner ups will each receive $15,000. You can continue to vote for your favs at nyxfaceawards.com to see them join the top 6 finalists which will be announced in late July. 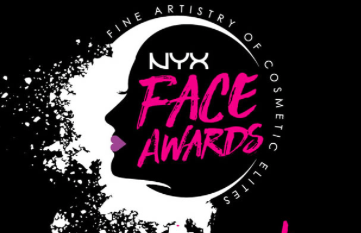 Also, the NYX FACE Awards will be live-streamed on nyxfaceawards.com and on NYX Cosmetics’ YouTube channel. Check out the list below for the top 12 finalists in NYX’s FACE Awards and comment below and tell me or tweet me at @alexisjoyvipacc, what is YOUR favorite product from NYX Cosmetics? Also, keep updated with the NYX FACE Awards competition through #NYXFACEAwards and on www.youtube.com/nyxcosmetics. Previous Article: Benjamin Stockham Had Loads Of Fun At Nintendo’s Kirby: Planet Robobot Event! Next Article: YouTube Sensation GloZell Set To Voice The Role Of Grandma Rosiepuff In The Animated Movie Trolls!